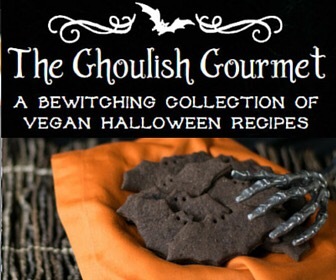 I was lucky enough to do some recipe testing for Kathy Hester, cookbook author extraordinaire, and can now announce that her Halloween Dinner Party e-book, ‘The Ghoulish Gourmet, a bewitching collection of Vegan Halloween recipes’ is ready to order! Another favorite was the Ghoulishy Green Potato Soup with pumpernickel croutons. If you love October and feeding friends freaky fun food, you will want to order your copy fast!